Artist's impression of Hornby Azhdarchoid. Credit: Mark Witton. A rare small-bodied pterosaur, a flying reptile from the Late Cretaceous period approximately 77 million years ago, is the first of its kind to have been discovered on the west coast of North America. Pterosaurs are the earliest vertebrates known to have evolved powered flight. The specimen is unusual as most pterosaurs from the Late Cretaceous were much larger with wingspans of between four and eleven metres (the biggest being as large as a giraffe, with a wingspan of a small plane), whereas this new specimen had a wingspan of only 1.5 metres. The fossils of this animal are the first associated remains of a small pterosaur from this time, comprising a humerus, dorsal vertebrae (including three fused notarial vertebrae) and other fragments. They are the first to be positively identified from British Columbia, Canada and have been identified as belonging to an azhdarchoid pterosaur, a group of short-winged and toothless flying reptiles which dominated the final phase of pterosaur evolution. 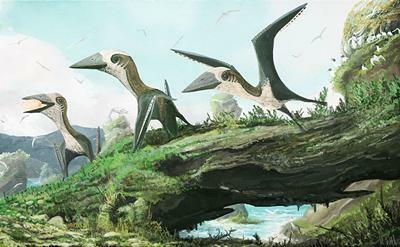 Previous studies suggest that the Late Cretaceous skies were only occupied by much larger pterosaur species and birds, but this new finding, which is reported in the Royal Society journal Open Science, provides crucial information about the diversity and success of Late Cretaceous pterosaurs. 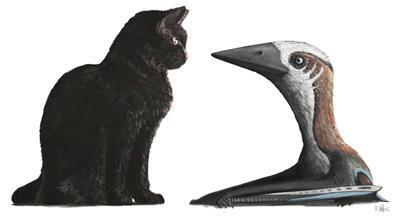 Small-bodied pterosaur compared to domestic cat. Credit: Mark Witton. The fossil fragments were found on Hornby Island in British Columbia in 2009 by a collector and volunteer from the Royal British Columbia Museum, who then donated them to the Museum. At the time, it was given to Victoria Arbour, a then PhD student and dinosaur expert at the University of Alberta. Victoria, as a postdoctoral researcher at North Carolina State University and the North Carolina Museum of Natural Sciences, then contacted Elizabeth and the Royal BC Museum sent the specimen for analysis in collaboration with Dr Mark Witton, a pterosaur expert at the University of Portsmouth.